Brother Steven Millhorn from Expounder Ministries sent me the following prophetic warning dream, which he received February 7th 2018. In the dream, I was in an office complex which had a very homey feel to it. One part was like a home setting and if you were to walk through some hallways, you’d be in an office setting. President Trump was in the same building, just down the corridor from where I was. There was a man sitting on a comfortable chair within the same building on the homey side of the building with a tray table pulled up next to him. On the tray table, he had two Styrofoam half empty coffee cups and a tall Kleenex box facing him. He looked like he was in his 50’s with a frontal bald spot and round glasses. He had planted a nuclear device in the same building where all of us were. I then began to telling the President about the man and that there was a nuclear bomb or device in the same building we were in and that the count down was less than 3-4 minutes. I urged him to immediately go outside and board his helicopter and leave. He agreed, so he and I left the front door of the building to board the helicopter. Then I briefly saw a flash image of his daughter, Ivanka. She was already outside, but there was no helicopter. I saw the President then go back into the house with her, leaving me alone, so I ran across the street to a neighboring house to hide behind it. I knew at that point that there was less than 30 seconds left, and even if there would have been a helicopter, it would not have escaped the blast. So I went about 70 yards away to hide behind a neighboring two story house. Then I remembered seeing those films of houses being leveled from the nuclear blasts. So I decided to find an area to lie down in like a hole or low place, but then I remembered nuclear blasts leave craters. I felt at this point that I too was not able to escape from the affects of the blast. Even though I was a ways from the building, I was still close enough to be destroyed by it. The dream ended at this point, seconds before the detonation occurred. The things that came to my mind as a result of this dream was that it was an inside job, it was going to happen quickly or not too far in the distant future, and that there would be no escape from it, even for Christians. I dont have any comment as it relates to this dream, however Id like to share with everyone a prophetic word given to evangelist Mario Murillo out here in California. As the story goes, Mario was walking the streets of San Francisco (his hometown)recently when he heard the voice of God….”everything that can be shaken”…….Very soon after Mario gets a phone call from a close associate from a bible college…..the associate calls Mario on the phone and says…..”Mario God just spoke to me……about 2018…..the word is this…..”everything that can be shaken will be shaken”. Mario walks a very close walk with God, you can take this word to the bank friends. Pray for Mario as well, he is suffering from some type of leg ailment and needs rest and healing. This prophetic dream from Michael Boldea, (grandson of Dumitru Duduman) and his brother, and an intercessor– three people had the same dream/vision the same night….Romania. I post because of the Word given to Mario walking in San Francisco….. Listen and obey His instructions……. California just moved to force public universities to administer abortion pills. It has been a long time since I interpreted a dream on Z3, usually I just read the dreams to seewhat God is speaking to the church. Tonight however as we were leaving the Morningstar Advanced Prophetic Conference I felt an unction to pull up Z3 so maybe I am supposed to share this..let us not forget most dreams are symbolic and not literal. I don’t think this was a dark dream but a warning/call to prayer for many of us who may have gotten too comfortable or lax in praying for our leaders. …a major theme at the dreams beginning. Coffee often represents bitterness….I feel the number 2 …2 cups symbolizes divisiveness and a lot of bitterness has been poured out with more to come. I dont feel the bomb is a literal bomb but something that has the potential to blow up in the presidents face…..probably dealing with a certain issue/tissue….the tissue may also represent him having sympathy for something and it being the trigger/red button that causes another controversy to blow up….as we know he has often not heeded warnings to get clear of these things. So pray for the wisdom of God for him in these matters. As I am typing this I feel the man with little covering is probably the bitter media…the stryfoam cups symbolizing their insulation from the real world. I dont think you would have been laughing were this literal bomb warning…but many times I have laughed and shook my head as I prayed for what Trump was embroiled in. Thanks for that interpretation Hilbilee. It makes a lot of sense. 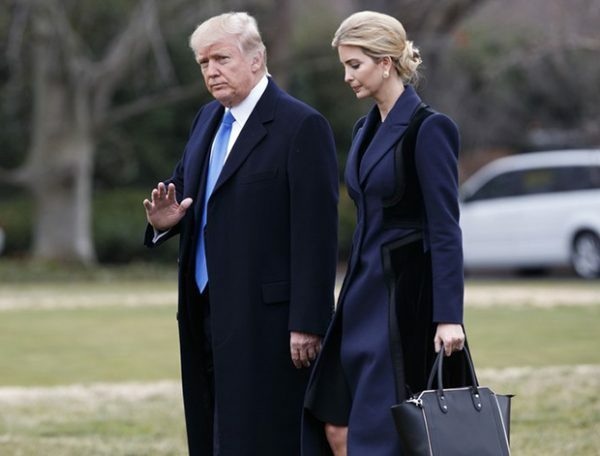 It occurred to me today 3-2-2018, that Ivanka and her husband are probably on the way out of the White House…..and in this dream, when President Trump went outside to escape to the helicopter that wasn’t there, Ivanka was already outside (out of the White house) before this dream’s end occurs, when he and she returned back inside. I bring this up…….because it could be a timing indicator. Once Ivanka is out of the white house that is….. Brother Steven, It could also mean Ivanka has left to observe sabbath on a Friday evening and she returns only Saturday evening. So possibly this false flag inside job happens on a week end. Brother Jeff Byerly also prophesied a nuclear false flag. Very conveniently this can be blamed on NKorea and they can be bombed to oblivion. Wonder what will be Russia and Chinese response. My gut feeling, AC can never rise as long as President Trump is holding office. I believe this is a warning to us from God in order that we may all pray to change the outcome of this attempt on the life of our President. Prayer changes things! So start praying saints! There was another prophecy by Glynda Lomax concerning 2018, and a new president taking over and he would be very evil. It all depends on our prayers, because prayer can stop this! Pray for Trumps protection! When reading that post I was led by Holy Spirit to look for the name meaning of Ivanka which originate from Hebrew with the meaning GOD IS GRACIOUS. Lets keep our prayers high for Mr. Trump & his family. this is horrific! Can prayer not change this? Yes Christine, prayer can change this. That’s the whole point of dreams and revelations from God… they are warnings and cues for the Body to pray that God’s will be done on the earth as it is being done in heaven. We are to pray ,not just for the next few weeks and months for the protection of Mr Trump and his family, but keep on praying …and praying until Mr Trump accomplishes everything God called him to. The enemy has been relentless. This is not the first revelation from God concerning assassination’ attempts against the President, and it won’t be the last. The enemy is not going to stop at trying to destroy God’s work and plans. That is why we need to keep on praying. ” God, confuse them until they quarrel with themselves. Destroy them with their own violent strife and slander…”. You know that it can, Christine! Satan would love to stop this great friend of Israel, this flawed but fearless David figure, through whom the Lord is working so mightly to bring about His will, in direct confrontations of man’s. Don’t believe the fear. God has not given us a spirit of fear. God also never speaks the problem without providing the solution. This is one way I’ve learned to test the spirits. God’s revelatory M.O. is revealed through John 16:33: These things I have spoken to you, that in Me you may have peace. In the world, you will have tribulation; but be of good cheer, I have overcome the world. We shall stand in the gap. This will not be. In King Jesus Name! If this dream manifests, it means the window of grace for Christians to get their house in order and get more oil for their lamps has ended. I was yesterday rereading a dream I had on 8th Jan 2010 in people were preparing to flee and at the point in the dream where the fireballs started falling from the sky, I fled with the Bridegroom. When I woke up, I lamented the small amount of food in the car we fled in. I asked if there was time to prepare more. The Lord said, “You have what you have. It has begun!” That shot me between the eyes yesterday. Sounds like this scenario means the same for Christians. Everything will change after this. I will try to get a link for the dream to post here. I just finished reading your excellent post of the dream given you on 1/8/10 and it is so very timely and I noted was posted on Z3 at 7:17am. Marty Breeden who is also a contributor to Z3news has an amazing word on facebook that has to do with the date 7/17. It is in regard to the day that he came to salvation 7/17 (1981) and the day he went code blue 7/17 (2015) Thirty-four years apart to the day!! I was prompted to research 717 in Strongs Concordance. 717 in Hebrew is Arah which means: to gather or to pluck. 717 in Greek is the name Armageddon, a place. It’s Harvest Time! The number 1810 (1/8/10) Strong’s in Greek is ‘exaiphnes’, which means ‘suddenly’ ‘unexpectedly’ or ‘all of a sudden’. The Lord has always impressed upon my heart this is how and when He our Beloved Bridegroom returns for us His Bride, very suddenly and at an unexpected time when men are eating and drinking, marrying and giving in marriage. Suddenly is also how judgment often manifests, as in the days of Noah, catching many unaware. Hi Christine – What a powerful dream & interpretation. I had knots in my stomach when I read “you have what you have”. Definitely a huge difference, as you noted between talking about preparation and being prepared. How can I read part 2? Thank you 💕 for sharing! Yes, it rings in my ears and gets me up in the morning when the blankets are trying to keep me in bed! This obviously is the White House which is a house + office. May be the Deep State enemies have planned a fiery nuclear false flag,which can be blamed on some enemy nation. They can also bring back Obama once President Trump is removed. James Bailey: What is the truth?? Prophets are forecasting doom for our President. We need to be crying out to God, not to James Bailey. Only God knows the truth and it is His spoken word that holds back the evil. The fight isn’t with flesh and blood, it’s in the spirit realm. We need to be in daily repentance, crying out to our Lord. He heard our cries and saved us from the consequences of an HRC administration. He continues to hear our cries and is shining light on all the darkness in this country, every day we see God exposing the enemy. We need to continue crying out to Him in repentance so He will continue to bring this country back to Him and position us, His remnant, to be His workers in the final Harvest. Your cry sounded to me like the Israelites crying out to Moses. Cry out to your Father, not to Moses (James). Lord please use these times to open our eyes and bring us back to close relationship with You. In Jesus’ Name! I believe prophetic dreams like this are warnings, not predictions. The outcome is up to us since we have been given authority in the name of Jesus. Need to remember that some prophets are false. Some are of Christ Jesus. It is your responsibility to judge by the Holy Spirit given to you by Messiah. Sharing a dream does not make a person a prophet. Hannaniah was a prophet of God, but spoke some things that did not come from God and claimed they did. Each of us is required to spend time with Jesus in our prayer closet. I agree prophetic warnings are a big part of the prophetic ministry, but I think it’s a mistake to limit it to that because the Apostle Paul explained the purpose for prophetic ministry is edification, exhortation and consolation (1 Corinthians 14:3). So even in the warnings of great trouble ahead, like we see in the book of Revelation, the ultimate purpose for prophetic ministry in the New Testament is to edify our faith, exhort us to hold onto our hope, and console us as we endure severe tests and trials. I see comments and emails from people on this site who embrace the warnings of trouble, but reject the messages of hope, even claiming those two are mutually exclusive, but I don’t think they are. I think both reveal the heart of God for His children and both are found throughout the Old and New Testaments. On Feb 6, he sent everyone scurrying to find original footage of the SOTU, because he said that the female Black Caucus member sitting next to the one playing “Candy Crush” on her phone, had been on her phone too–texting “Trump should be shot!” But after many hours of work, anons couldn’t locate either still photos or film that was legible, showing her texting that on her phone. (Bummer.) It appears that security footage captured it, but we can’t get access to that. And on Feb 10… he said cryptically that “PEOC force failed.” That’s the Presidential Emergency Operations Center, the bunker deep under the W House. It’s not totally clear but it appears that Someone(s) went after POTUS down there, and fortunately it didn’t work (?). Bottom line, as I said, this post ties in. we need to pray for the man with the frontal bald spot who has obviously shed tears about some issue close to his heart and Trump’s stance on it. Anyone able to identify him?